"Story From Website Main Page"
March 16, 2013 ..... Holy Cow indeed! Bike Mike cycling in the "Coast the Coast" since 1993 and have not skipped a year. Awesome indeed!! Mike cycled them all in this tour. Thunderstorms, windy weather, chilly weather, hot weather, detours and wipeouts in the tour. 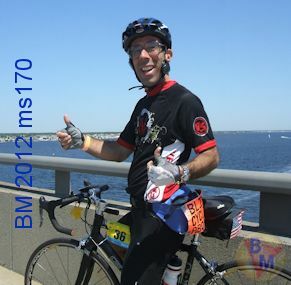 Mike even broke his personal record for the amount he raised in May 2012 for Multiple Sclerosis. Also, Mike will be recording with his GoPro camera this May 2013 "Coast the Coast" tour. Mike is so happy that he been cycling in the MS "Coast the Coast" for 20 years. May 9 2,103 . . Mike suppose to do a email interview for the local Belleville times paper. Instead of a email interview. It turned into a Special Guest Columist. To see the online paper write up. Follow this link HERE. The New Jersey MS Chapter has posted about Mike on there Facebook page HERE. Mike is currently working on a 20th year poster for the start line. Going to make it so cool for the bike tour. Mike just got his package for the bike tour. All info needed for the bike tour. His number is #21. The lowest in a long time. The lowest Mike ever had was #12 years ago. May 16, 2013 . . Donation Update Time > > > Mike will not be able to reach his goal of $5,000 as predicted. He was sure he was going to reach it. Here is the breakdown. One friend of a group thought I asked to late. But told them back in April. They been busy and can not donate now. Said they will in 2014. 2nd one is a town club and still no word from them. They was donating. 3rd one is a well known Belleville company. They stayed in touch. But in the last minute. They can not donate. Tey have not donated anyplace. I have to wait to a meeting thursday night if donation is approved. May 30, 2013 . . . Mike has rode in the 2013 "Coast the Coast" MS bike tour for his 20th year has passed. Will have full details and photo gallery soon. He hopes to reach the amount he raised in 2012. We all shall see what happens. Because the online donation will stay open to June 7th 2013. Before switching to the September online donation. For Mike to prepare for the September MS bike tour. For the first time ever. Mike recorded the bike tour with the Go Pro camera mounted to his vented helmet. It will include a interview with MaryBeth from the MS Society September 2012. This will need to be edited. Posted to youtube channel in the near future. Mike will again use the GoPro camera and record the 2013 "Coast the Coast" 170 mile bike tour.